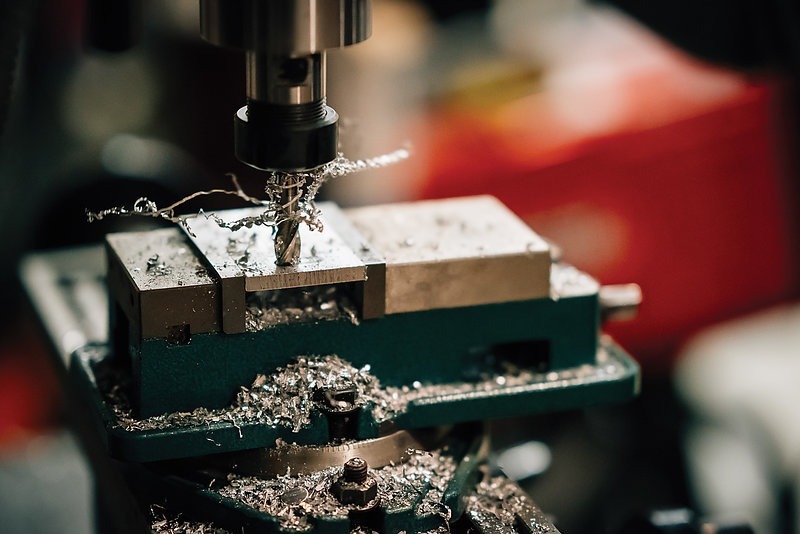 From routing and cutting to gluing and welding, the list of tools required for a full-scale buildout is not short. Tyler Earnheart puts in some late night hours on Jill and Bryn's van. Searching for new vistas and being dwarfed by new mountain ranges proves a never-ending quest, and nothing enables us in that pursuit more than a mode of transportation. Two wheels provide ample possibilities, but four with a roof increase those opportunities to a near-infinite number when considering distance and necessities. Every vehicle is adventure worthy—like photographers say, “The best camera is the one you have with you”—but in this case, it’s possible to make the “best” even better. Professional mountain bikers Jill Kintner and Bryn Atkinson travel the globe riding bikes and know all too well what they need to enjoy life on the road. 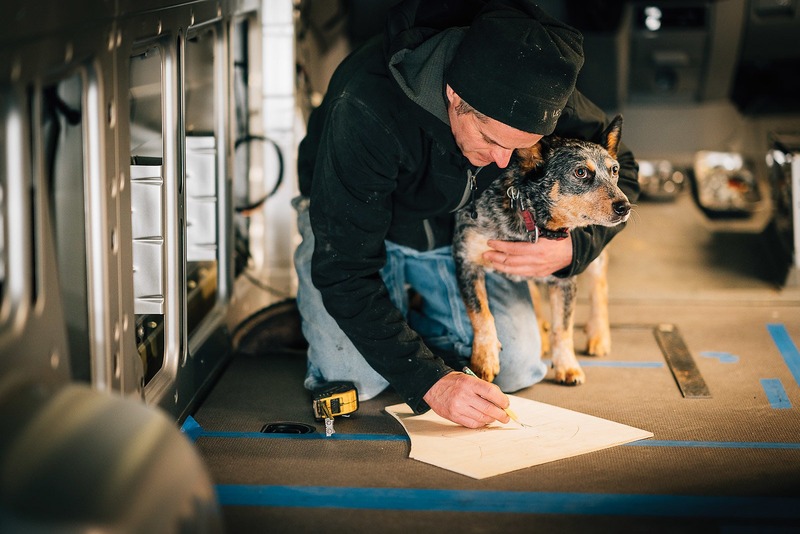 The pair kicked off 2019 with a monthlong adventure in their new Sprinter van, leaving the Northwest behind for the sunny days and dry trails of California. This is the second van they’ve built out and applying their prior knowledge and experience to a blank slate yielded a much different result. We caught up with Jill to find out a bit about what went into the thought and process of their new van. When working 300 hours in six weeks, some long days are guaranteed. Tyler Earnheart tackles the inside details early on in the build. There are a lot of parts and processes when it comes to doing things right, and multitasking is key for efficiency. Even the unseen details need attention, and the surplus of weird curves make for some creative approaches. Transforming the van from a metal shell into a fully furnished, adventure worthy rig took six weeks (or about 300 hours). Tyler Earnheart of Northwest Conversions was the mastermind behind the design and build, with input from Jill and Bryn to make the interior perfectly match their needs. This is the duo’s second van, and through the years of the first, they decided it’s the vehicle that best meets their needs. 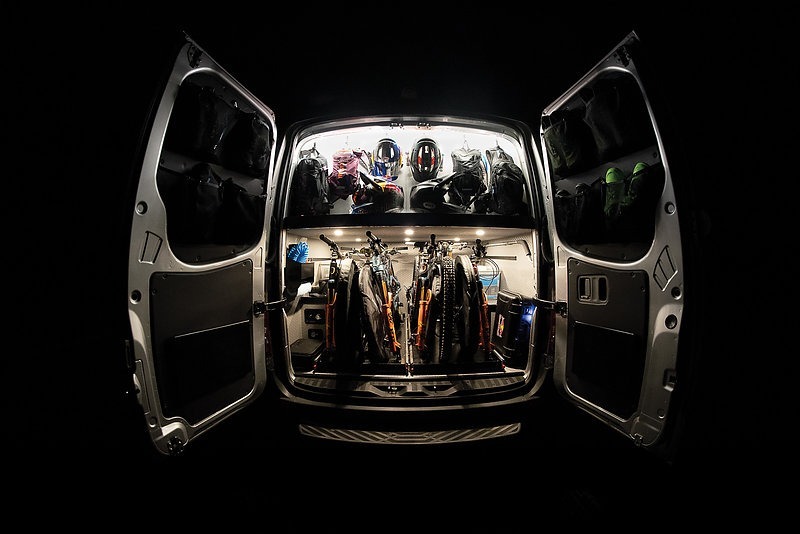 Jill Kintner: There are a lot of options, but the van route is really good for customizing space, keeping things safe inside, and being able to drive around easily. I think the choice really depends on what you are trying to do and how many people you have to fit in. We built this van for two people and a bunch of bikes, so the compactness of a van makes traveling around and riding super comfortable. Our intent was never to live in this van, but it is amazing for a few days of adventuring at a time. The new van allowed them to rethink their design, while downsizing challenged their special creativity and what they deemed essential. Mainly we changed the footprint. Going from the big 170 extended wheelbase to a shorter 144 wheelbase with a low roof meant we had to be more thoughtful with the space, but I am so happy to have a nimble little van to drive around. We downsized a lot, but accomplished most of our same goals, so we have the things that matter most. 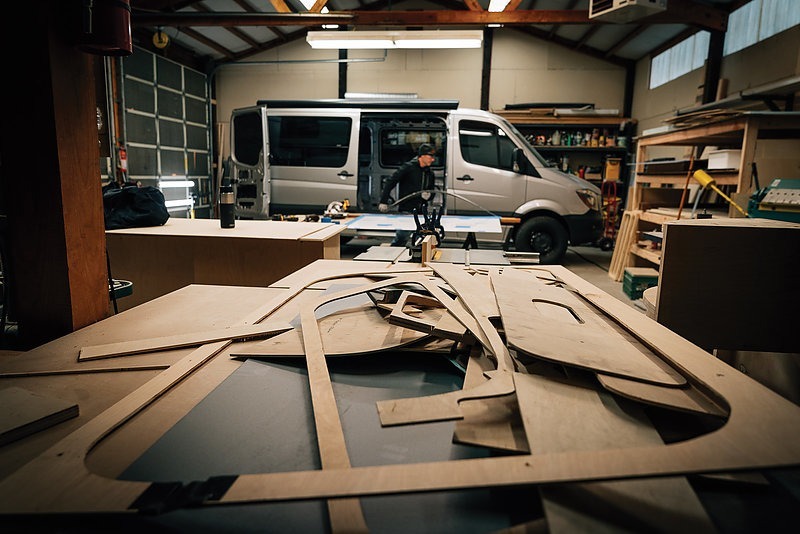 With each van build, you learn a lot about what you actually need, and minimizing feels better overall. This new van is incredible, and we are really happy with how clean and nice it turned out. NW Conversions did a great job. Starting with a blank canvas makes for unlimited possibilities. However, it’s also a serious undertaking, and requires a bit of patience. Since most builds are custom, the timeframe can vary quite a bit… Tyler Earnheart said they range anywhere from 5-10 weeks depending on the size of the van and what you put in it. Our van started out as an empty shell and we wanted a lot of custom features so it took about six weeks or 300 hours. 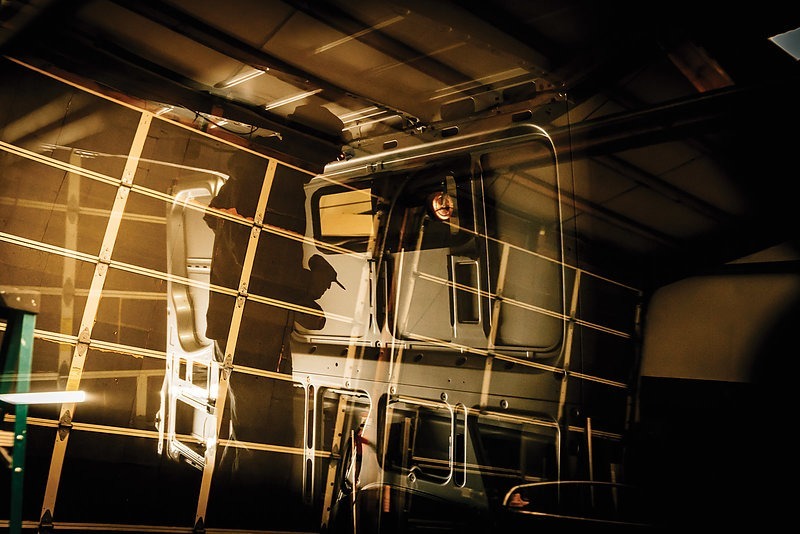 Nothing inside the metal framework of the van is perfectly square; there are a lot of curves and weird angles, so being clever as a builder to make everything fit perfect is the tricky part. 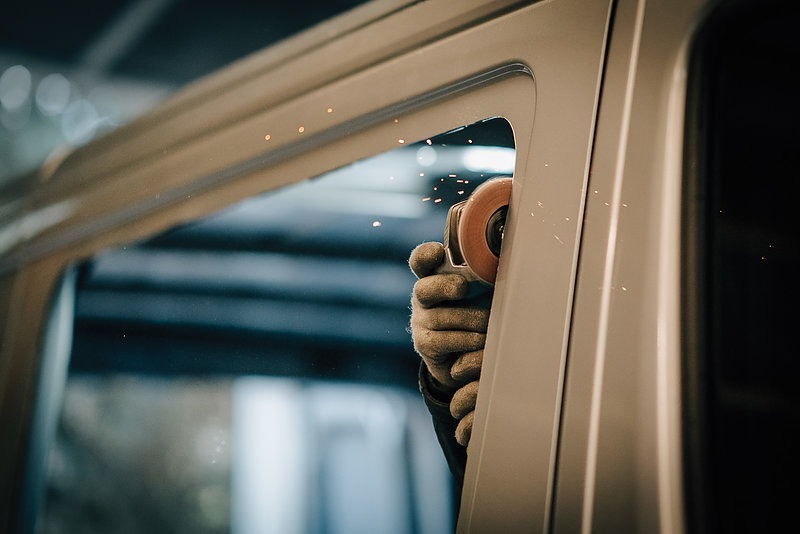 You see a lot of installers who bolt premade things together, which looks dreamy on Pinterest, but being able to fabricate little brackets, or make custom cabinets to fit exactly pays off in the long run for a quiet van built to last. An extra pair of hands—or paws—are always appreciated. As an artist, Jill knows the importance of toiling over the details—sometimes it’s even the fun part. I loved every bit of the process, besides having to wait. Sketching out the design was really fun, picking materials, but also seeing the daily evolution and problem solving impressed me so much. We were in the shop documenting this build, obviously, and I now have way more appreciation for how much skill went into crafting this van. Tyler is a real pro with his background as an electrician and project manager, so he was always one step ahead in the planning; multitasking with vendors, figuring out challenges, ordering parts, etc. He has so many clever little systems in place for efficiency, but there are also a lot of painstaking little jobs that don’t seem that fun. I learned a lot as a witness/minimal helper, but don’t know if I would ever want to build one by myself after this; it takes so much time and really good craftsmanship to do it right. Being professional mountain bikers, Jill and Bryn have a unique—and acute—awareness of where their priorities lie. Storage is always the most crucial part; We have a snack drawer above the fridge, a really deep cabinet with a flip-up latch at the foot of the bed, the helmet/pack storage in the back (which is also nice separation from the outside elements), wheelwell- box space, door pockets, and a storage box on top for bigger things. The sliding bike trays in the garage are pretty nice as well. We played bike Jenga to get the layout perfect for six bikes, but with the little clamshell Rocky Mounts on the front axle, it’s really easy to pack up or unload. There really is quite a bit of space in here. Clean and minimal—but with everything that's needed for a couple of weeks on the road. There’s no need to pare down the quiver when you’ve got room for everything. 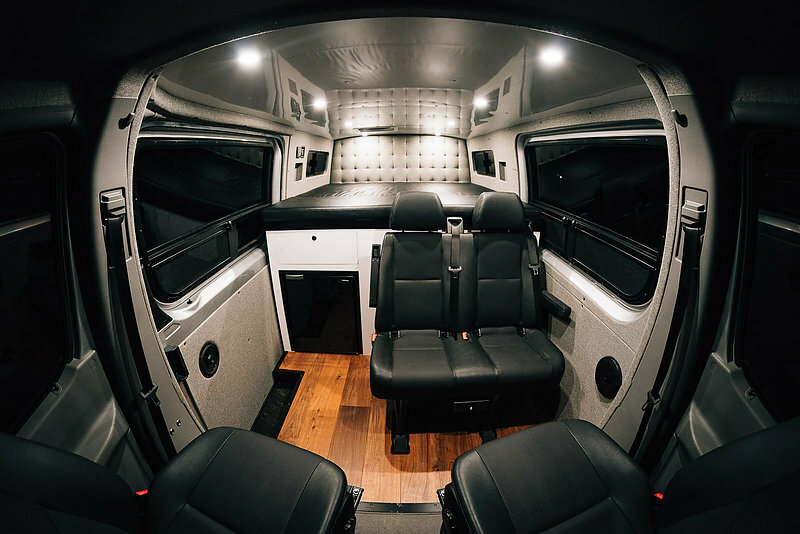 The “garage” in Jill and Bryn’s new Sprinter was specifically designed to hold their bikes and riding gear, while the interior keeps the experience plush. Of course, the perfect adventure vehicle doesn’t come without a few minor (but worth it) downsides. It’s mostly the best, but dealing with bathroom stops and being clean after riding is sometimes a bit annoying, especially on muddy days. We have a water tank/hose set up to spray off, which helps, but it’s not quite like a hot shower at home. Tyler has built a few vans with a custom stand-up heated shower inside and everybody raves about that, so I would suggest that for people who don’t mind driving one of the bigger vans. Now that they’ve got their rig dialed, there’s no limit to the possibilities. We’ve gone all over the United States and Canada. We zip up to Whistler quite a bit in the summer for a couple days of riding at a time, but our last van ventured to the east coast several times, Colorado, a month in California each year, etc. The nice part about the van is that it opens up options. Stay, go, whatever... we have bikes, a fridge and a place to sleep so there isn’t the same urgency to get home as if you were in a truck or something. I already love the size, so we are excited to test it out and see some new places!